In 2007, the Tianjin Binhai New Area (TBNA) and one of its administrative zones, the Tianjin Economic-Technological Development Area (TEDA), in northeast China commissioned the RAND Corporation to perform a technology-foresight study to help them develop and implement a strategic vision and plan for economic growth through technological innovation. The principal objectives were to identify the most-promising emerging technology applications for TBNA and TEDA to pursue as part of their plan for growth, to analyze the drivers and barriers they would face in each case, and to recommend action plans for each technology application (TA). Seven TAs should form a pivotal part of TBNA's comprehensive strategic plan: cheap solar energy; advanced mobile communications and radio-frequency identification; rapid bioassays; membranes, filters, and catalysts for water purification; molecular-scale drug design, development, and delivery; electric and hybrid vehicles; and green manufacturing. The specific action plans can be integrated into an overarching strategic plan that rests on three legs: building a state-of-the-art R&D program; updating and expanding TBNA and TEDA's manufacturing base; and positioning TBNA and TEDA for the global marketplace. The plan offers TBNA a wealth of opportunities that will position it for the future development it envisions, and each TA emerges from one or more of TEDA's current pillar industries, making for a fluid transition that builds on existing strengths. Richard Silberglitt, Anny Wong, et al. This study was sponsored by the Tianjin Binhai New Area (TBNA) and the Tianjin Economic-Technological Development Area (TEDA) and was conducted under the auspices of the Transportation, Space, and Technology (TST) Program within RAND Infrastructure, Safety, and Environment (ISE). 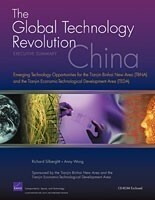 Silberglitt, Richard, Anny Wong, S. R. Bohandy, Brian G. Chow, Noreen Clancy, Scott Hassell, David R. Howell, Gregory S. Jones, Eric Landree, and Parry Norling, The Global Technology Revolution China, Executive Summary: Emerging Technology Opportunities for the Tianjin Binhai New Area (TBNA) and the Tianjin Economic-Technological Development Area (TEDA). Santa Monica, CA: RAND Corporation, 2009. https://www.rand.org/pubs/monographs/MG776.html. Also available in print form.